A basic element characterizing the cultural tradition of Greece is Christianity, which came to Greece very early (1st century AD). The monuments of the Greek Orthodox religion are an integral part of the national heritage and attract a considerable number of visitors. This cultural heritage, whose important facets are found throughout Greece, draw tourists with such attractions as Mount Athos, a treasure chest of Greek Orthodoxy; the medieval monasteries on top of the almost inaccessible “hanging” mountains of Meteora (in Thessaly); and a tour retracing the steps of Apostle Paul in Greece. - Monastery of Aghios Nikolaos Anapafsas (1500-1537), Tel. 24320-22375, 77392, Fax 79138. - Roussanou Monastery (1545), Tel./Fax 24320 22649. - Varlaam Monastery (1517-1548), Tel. 24320-22277, Fax 75386. - Megalo Meteoro (Metamorfossi) (1380-1552), Tel. 24320 22278. - Aghia Triada Monastery (15th-18th century),Tel. 24320-22220, 77123. - Convent of Aghios Stephanos (1500-1798), Tel. 24320-22279, Fax 25100. The Byzantine castle-state of Mystras (Tel. 27310 83377), 5 km. north - west of Sparta, is the most important and most representative example of a Byzantine city of the 14th and 15th century that exists. Monemvasia, clinging to its rock, occupies the Minoa peninsula. Today a causeway bridges the gap that separates the former peninsula from the mainland and leads behind the fortification walls into a unique, intact medieval city - state. Monemvasia possesses a wealth of Byzantine churches, around 40 of them. Among the most outstanding are Aghia Anna, (14th c.), Aghios Nikolaos (18th c.), Panayia Kritikia, Aghios Stephanos (16th c.), and Aghios Pavlos (10th c.). The most important of all is the church of Christ Elkomenos (13th c.), Monemvasia’s cathedral, with its 4 Byzantine icons and its 2 marble imperial thrones. On the top of the rock stands the Castle itself, while the church of Aghia Sophia (13th c.) stands at its steepest point. This is a rare example of an octagonal church with dome and few frescoes. Christianity came to Macedonia when it was still in its infancy, brought by Apostle Paul himself, who travelled and taught on its soil. Magnificent, churches and monasteries were erected throughout Macedonia, and today in Thessaloniki, which became the second city of the Byzantine Empire, there are 57 churches and 40 monasteries. In Kastoria there are dozens of churches whose interiors are decorated with the portraits of archangels and saints; in Veria, the church of Christ is famous for its colourful compositions; while nothing can compare with the jewels of the Monastic State of Mount Athos. The cradle of Orthodoxy and Monasticism. A living testimony to the Byzantine Greek Orthodox tradition. Mount Athos, in Greek Aghion Oros (Holy Mountain), is a monastic state which for more than 1,000 years has been existing in accordance with rules of life and religion that have not changed since Byzantine times. In its prime there were 40 monasteries here and some 4,000 monks. Today, however, this number has been reduced to 20, peopled by some 1,500 monks. Apart from the monasteries, there are other, smaller monastic residences, such as the sketes, and countless hermits’ huts. Mount Athos is a veritable museum of Byzantine and post-Byzantine art. As the visitor walks to the different monasteries, he will be astounded not only by the frescoes, but by the richness of the libraries, the mosaics, the valuable smaller works of art, the liturgical vessels and the diverse heirlooms within their walls. Men wishing to visit Mt. Athos can board a boat either at Ouranoupolis or Trypiti for Dafni, and from there proceed by road to Karyes, the capital of Athos. (HOLY SUPERVISION Tel. 23770-23711/2, Fax 23713. Postal address: GR-630 86 Karyes). Karyes is the site of the peninsula’s oldest church, the Protato (10th c.). 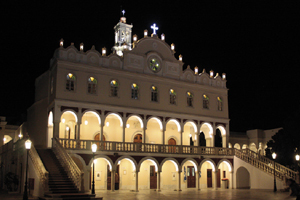 Hospitality in the monasteries can be offered only after prior arrangement. For entrance to the Holy Mountain, one must be in possession of an individual or group visitor’s permit which can be obtained from the HOLY EXECUTIVE OF THE HOLY MOUNT ATHOS, 109 Egnatias St, GR-546 35 Thessaloniki, Tel. +30-2310-252578 (for foreigners), Fax 222424. Patmos is the most northerly large island of the Dodecanese group. It was in a cave here that St John the Divine (Aghios Ioannis o Theologos) was exiled between 95 and 97 AD and was inspired to write the Book of Revelation or Apocalypse. 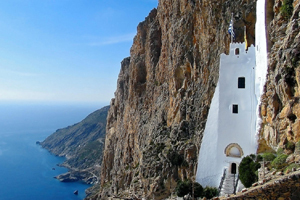 The cave lies halfway between the port of Skala and the island capital Hora, and in front of its entrance is the church of St Anne (Aghia Anna), built by the Blessed Christodoulos. In the 17th c, around the cave was built the Monastery of the Revelation (Moni tis Apokalypsis, Tel. 22470 31234). In the area of the cave there is also the buildings of the Patmian School housing today the Theological College (Tel. 22470-31278, Fax 31777, www.patmias.gr). Patmos’ main attraction is the castle-like Monastery of St John the Divine (Moni tou Aghiou Ioanni tou Theologou, Tel. 22470-20800, 20802, Fax 31577. Library Tel. 22470-32095, 20809, 20810, www.monipatmou.gr) in Hora. At the end of the 11th c, Christodoulos Latrenos, a Byzantine hermit, came to the island and in 1088, with the backing of the emperor, Alexius Komnenos, started building the Monastery until his death in 1093. Nowadays, the Monastery, which is one of the most important worldwide monuments in the history of architecture and Orthodoxy, is something of a treasury house containing over 900 Early Christian manuscripts, a large collection of icons and the most important collection of monastic artifacts on display in Greece. In Hora, there are also the Convent of Zoodohos Pighi (Tel. 22470 31991), founded in 1607, and near it the Monastery of Aghia Aghion (Tel. 22470 31030). Further away from Hora, 3.5km to the west, is the Convent of Evangelismos (Tel. 22470 31276) that perches like a balcony over a deep ravine on the south-west part of the island. Here, some 40 nuns are employed in religious painting, sewing relegious garments, beekeeping, horticulture and floriculture. On the north coast, at the locality “Livadi Kaloghiron”, 4km north of the village Kambos, is the Monastery of Panayia tou Livadiou. In Hora and all over Patmos there are dozens of interesting churches and chapels of the 15th, 16th and 17th centuries. Christ’s Apostle Paul, one of the greatest ecumenical personalities in history, is the person who preached the Gospel to the Greeks, showing particular interest in the country of Greece and the state of the Churches he founded in Greece. 1st Apostolic Journey (47-48 AD): Seleucia, Salamis, Paphos, Perge, Antiocheia, Ikonio, Lystra, Derbe and back again as far as Antiocheia and Jerusalem. 2nd Apostolic Journey (49-52 AD): Derbe, Lystra, Phrygia, Galatia, Troas, Samothrace, Neapolis (Kavala), Philippi, Thessaloniki, Veria, Athens, Corinth, Ephesus, Caesareia, Jerusalem. 3rd Apostolic Journey (52-56 AD): Antiocheia, Galatia, Phrygia, Ephesus, Macedonia, Corinth, Macedonia, Troas, Assos, Mytilene (Lesvos), Samos, Miletos, Kos, Rhodes, Patara, Tyros, Jerusalem. 4th Apostolic Journey (59-61 AD): Caesareia, Sidon, Myra (Lycia), Cnidus, Kali Limenes (Crete), Melite (Cephalonia), Syracuse, Regium, Potioli, Rome. 5th Apostolic Journey (62-64 AD): Asia Minor, Crete, Macedonia, Illyricum, terminating in Rome where Apostle Paul was beheaded during the reign of Nero (67 AD). 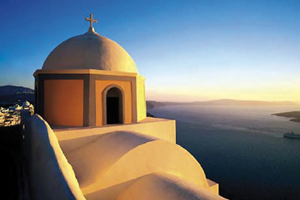 All the cities and places where Apostle Paul stayed in Greece and created Churches are very interesting and offer the visitors the opportunity to combine their visit of the religious monuments and archaeological sites with the exploration of the historical, cultural and architectural heritage of these places.